Each year, hundreds of thousands of new students begin their college journeys in one of the 114 California community colleges. The community colleges are the biggest gateway for California high school students to enter higher education. And it is the most important gateway for young men of color—approximately 115,000 first-time freshmen each year, many of whom are hoping to go on to earn a bachelor’s degree as an important step on the path toward career and financial success in today’s economy. Despite making up a significant portion of the community college enrollment, the outcomes for young men of color differ dramatically from their peers. Less than 39% of these students earn a degree, certificate, or transfer within six years. On many campuses, faculty and staff are working to address these equity gaps with supports aimed at young men of color. Targeted learning communities, mentoring, and leadership development are valuable programs that can improve the experiences and outcomes of young men in college. By their nature, however, these programs serve a relatively small number of students and have only made limited progress in improving outcomes on a broad scale. Thinking about differences in student achievement from this perspective shines a light on institutional practices, big and small, that colleges can change to serve students equitably. In CCEAL’s workshops, educators from different campuses highlight many of the same areas for improvement: gathering data on how different student populations are being served, investment in faculty development, and consistent support from campus leadership. The first step in closing equity gaps is identifying what gaps exist by disaggregating data. A crucial factor for increasing engagement by young college men of color is training educators in practices to support their needs. 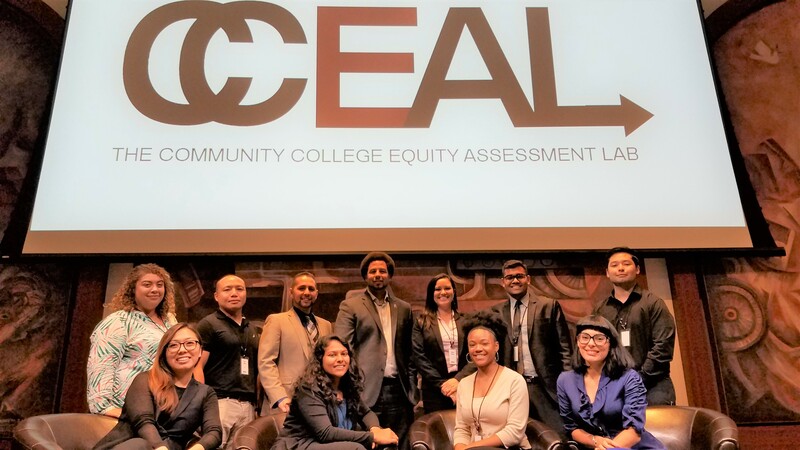 CCEAL’s research echoes other studies showing that culturally-relevant teaching, collaborative learning, and building relationships with students all boost achievement, especially for young men of color. Investing in professional development around such practices—especially for the part-time faculty who often teach the bulk of entry-level courses—has effects that ripple far beyond individual classrooms. Changing systems to ensure equitable outcomes for young men of color requires strong commitment and coordination from all elements of a college—leadership, faculty, and staff. Among the California colleges that CCEAL works with, the most successful at improving student outcomes are the campuses with strong commitment and coordination from all elements of a college—leadership, faculty, and staff. Campus leadership has a particularly powerful role to play in embedding equity in a college’s strategic plan and priorities, supporting staff and faculty development, and shaping the practices of the institution as a whole to be “student ready.” CCEAL’s research shows that these institution-level reforms lead to greater and more sustainable gains for young men of color than targeted programs and periodic activities. As one example, San Diego Mesa College recently opened a new space for staff and faculty development called the LOFT (Learning Opportunities for Transformation), which has resources and programming to facilitate conversation about equity, student-centered practices, and other teaching supports. A hub like this represents a sustained and transparent investment in practices to advance equity and continuous learning to better serve students. In California, a number of recent statewide initiatives are aimed at accelerating equity improvements in the community colleges. One major change is a new formula—introduced in last year’s state budget—for distributing state funds to the California Community Colleges (CCC). Rather than tying funding only to the number of students enrolled full-time, part of the allocation will be determined by how many students in a district are low-income, and how successful colleges are in graduating students with degrees and certificates. This new funding formula is designed to support the CCC’s Vision for Success, an ambitious plan to improve student success and close equity gaps in achievement by 2030. Recent legislation has also taken aim at a significant barrier to equity in the community colleges: remedial education. Assembly Bill 705, which be fully implemented statewide in the fall of 2019, will transform how community colleges place students in English and math courses. Research shows that one-time placement tests are poor assessments of students’ capacity to succeed in college courses, and over-refer students—and especially students of color—to remedial education who should have been placed in credit-bearing courses. Rather than prepare students for college-level work, remedial courses have become a barrier for many students to make progress toward a certificate or degree. In California, only 9% of students placed two levels below credit-bearing courses ever earn a B.A. degree. AB 705 requires that colleges use multiple measures of readiness—placement tests as well as high school transcripts and previous coursework—to place students, and requires that basic skills course sequences are designed to prepare students for college-level curriculum within one year.